From Van Dyck to Bellotto. Splendors of the Savoy court. The one showing at the Palais des Beaux-Arts falls mainly under the second category, even if some of the works come from other museums in the Piedmont region of Italy. The Sabauda Gallery has just closed its doors and will reopen in 2011 in a wing of the Palais Royal, in a larger exhibition space. The aim here is to evoke the fortunes of the collections belonging to the Dukes of Savoy. The accompanying catalogue, despite the uneven quality at times of the photographs, includes useful essays on the history of the museum and the art at the court in Turin. The entries, filled with facts, are very complete. This exhibition has many qualities : a clear itinerary, beautiful paintings, backgrounds with very suitable colours… However, the presentation itself has two major drawbacks. Once again, it bows to the unfortunate fashion consisting in dramatization of the lighting. The rooms are plunged in darkness and the works are illuminated with spotlights. Although the visitor eventually becomes used to the obscurity and the effect is progressively attenuated, we would one day like to know the reason for such a staging which in fact hampers a full view of the objects. The other concern lies in the hang : some paintings are too high, others too low and the “books of hours”, lying flat, are almost invisible. The show begins with a room devoted to the large portraits of the Savoy court. There is an admirable Equestrian Portrait of Christine de France as Minerva by Charles Dauphin, a student of Simon Vouet from Lorraine who spent his career in Turin and who, further on, also has a large Massacre of Niobé’s Children. The second section, with primitives, is the weakest despite the presence of a Mantegna “and workshop”, the latter seeming to dominate. The 17th century, on the other hand, is of the highest quality. 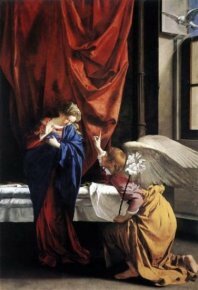 This portion of the visit, enriched by a large Cerano and a Christ on the Mount of Olives by Francesco del Cairo, is particularly interesting thanks to a very well-known masterpiece, the extraordinary Annunciation by Orazio Gentileschi (ill. 1). 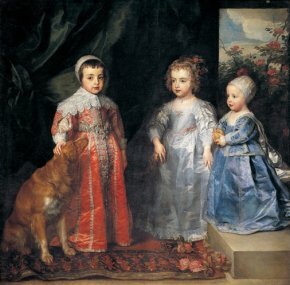 Among the Flemish works, there is a charming painting by Van Dyck representing the children of Charles I (ill. 2). A fine copper by Guglielmo Caccia, known as the Moncalvo, representing Abraham and the Three Angels, only joined the collections in Turin in 1992. The museum thus enriches its holdings regularly, and their recent history is also explained. 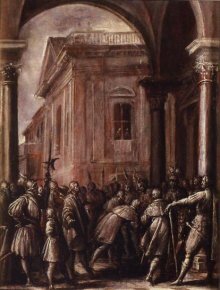 Visitors can see a panel by Isidore Bianchi, Amedeus VIII Duke of Savoy with the French King Charles VI, acquired at Christie’s in June 2007 (ill. 3) by the Compagnia di San Paolo. 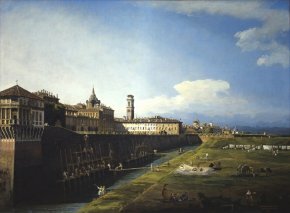 For the Settecento, special attention goes to a View of Turin by Bernardo Bellotto (ill. 4). The large ceiling studies by Claudio-Francesco Beaumont are of fine quality, but less attractive than those by the Roman or Neapolitan artists. Giuseppe Maria Crespi is represented with one of his best paintings, Saint John Nepomucene Confessing the Queen of Bohemia, which deserved a better place in the hang. An impressive Saint Peter on his Cathedra, considered to be a copy, has been reattributed with certainty to Anton Raphaël Mengs. It closes the exhibition, at least for the paintings, as the last room is devoted to four tapestries, acquired in 1946, representing The Parts of the World. Although the author of these cartoons is unknown, several comparable hangings have been found. This series was woven in Brussels around 1750-1756 by the workshop of Frans van der Borght. Carla Enrica Spantigati (ed. ), De Van Dyck à Bellotto. Splendeurs à la cour de Savoie, Bozar Books by Umberto Allemandi & C., 2009, 254 p., 35 €. ISBN : 978-88-422-1677-3. Visitor Information : Palais des Beaux-Arst, Rue Ravenstein 23, 1000 Brussels. Phone : + 32 (0)2 507 82 00. Open daily except Monday from 10.00 - 18. 00, Thursday until 21.00. Rates : 9 €.